The Congress of Energy and Electric Equipment (CEEER 2014) is built on the event year Conferences of Electrical Equipment and Automation (EAEC). 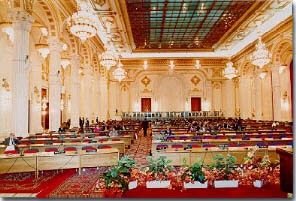 this edition Will Be in Place Parliament from Bucharest, Romania Between 9 and 12 September 2014. Generated by the Need to expand the topics and to approach in detail the proposed Subjects of matter, thus involving a larger number of Specialists in the field, from Romania and abroad, CEEER sets to become year 2014 benchmark annual event in the Romanian energy field. This year, CEEER is taking like in parallel with the Largest exhibition of electrical equipment and automation in Romania - IEAS (International Equipment & Automation Show), During the 11-12th September, at Parliament Palace, N. Balcescu Hall. CEEER tends exponentially to become one of the events on Romanian market trade, Bringing together the most important companies in the energy and electrical equipment field, leaders in the academic environment and state institutions, business people and decision makers from the energy field. CEEER 2014 is Meant to become one of the most important events in the Romanian energy and electrical equipment field, dedicated to Energy Specialists and Those Involved in connex domains. It is the only forum Where one can get a grasp of the full image on the Economical Situation, the force of the market, the newest technologies, developments and new trends constantly in the industry. CEEER 2014 Represents the potential of new research developments, business relations, the continuous change of ideas for the energy market in Romania and the generator of Implementing new solutions for the harmonious development of international research.